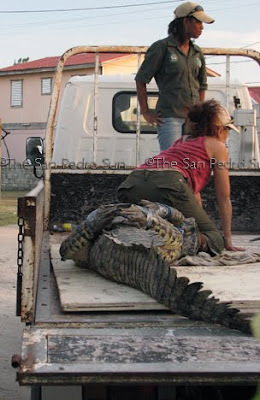 On Thursday, July 15th, Wildlife Officer Rasheda Sampson of the Belize Forest Department (BFD) and the ACES / American Crocodile Education Sanctuary team captured two, large problematic crocodiles from the WASA lagoon area south of San Pedro Town. The crocs, showing no fear of humans, came rushing out of the water when approached, looking for a chicken handout. 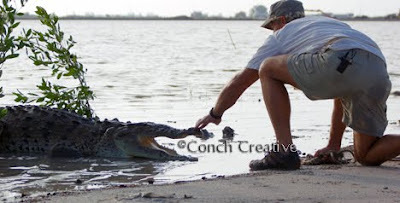 This is not a normal behavior for wild American Crocodiles, Crocodylus acutus, which are primarily fish eaters. Normally an apex predator of this size would move away from human activities. 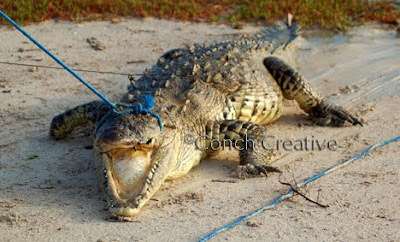 These crocs, having been illegally fed for years as a tourist attraction, have been conditioned to seek humans out for food. 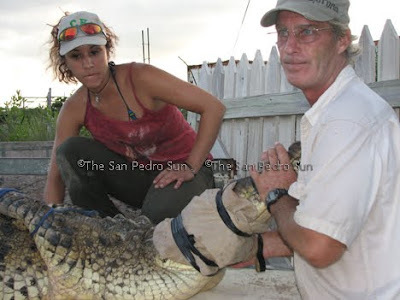 The ACES team, consisting of Vince and Cherie Rose, BFD Wildlife Officer Rasheda Sampson, and Crocodilian Parasitologist PhD Student Marisa Tellez, consider the capture to be a success and hope that these two animals are the last of the problematic crocs from direct illegal feedings. Both rescued crocodiles were transported to ACES in Punta Gorda and are adapting to their new environment. 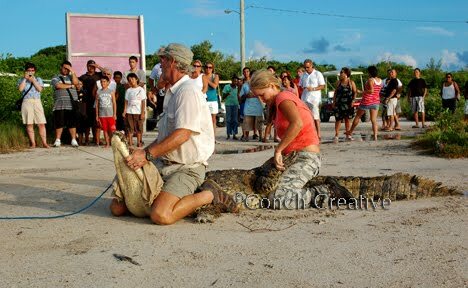 The ten-foot male crocodile was named ‘Fast Eddie’ after Eddie from Coastal Xpress who generously and quickly transported the crocodiles from Ambergris Caye to Belize City. The nine-foot plus female croc was named Xanadu in honor of Xanadu Island Resort who graciously donated lodging and transportation for ACES team. Although the relocation is considered a success, removing the problematic crocs is just a band-aid to the situation. Ideally, the community needs to continue to work on not feeding these modern day dinosaurs by discouraging the illegal croc feedings and also by properly disposing of food wastes. These actions, combined with education, should in time allow humans to safely coexist with this extremely important species. 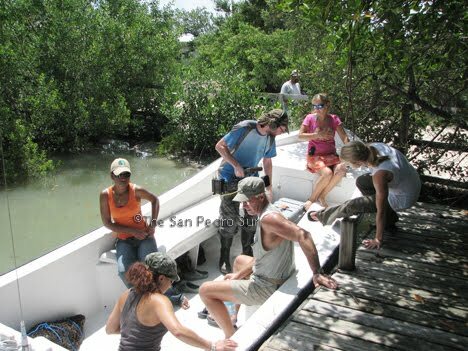 Working with the Belize Forest Depart, ACES has determined that in order to properly understand and manage the crocodiles in the area a population assessment must be conducted on Ambergris Caye. Not only will this study give an estimate of the number, size, and location of crocodiles on the island, but it will give a look at the health of the population as well. During recent relocation missions ACES has noticed that several of the large, wild crocs are lacking teeth and showing signs of illness. One of the crocs relocated to ACES from this most recent capture demonstrates the same signs of illness as ‘Bubbles,’ the croc from Ambergris Lake that died last month during a rescue attempt. “The community should be very concerned. When a species at the top of the food chain starts to become ill in the wild, something is very wrong in the environment,” stated Chenot-Rose. 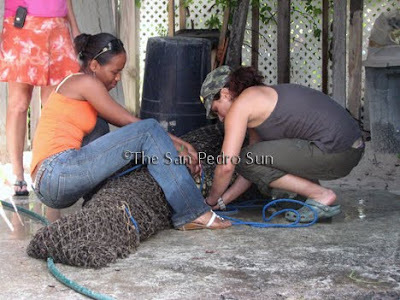 Chenot-Rose will be in San Pedro the first week of August to raise funds for the population study. The proposal has been approved by the BFD; however, there are no funds available to cover the costs of such a study. “I intend to ‘beat the pavement’ so to speak with the proposal and am very confident that members of the community will realize the extreme importance of the study and show their support by donating to this pertinent Crocodile Conservation effort,” commented Chenot-Rose. 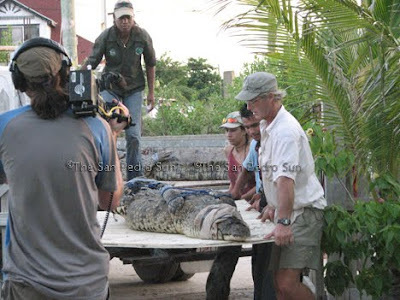 “ACES long-term goal is to remedy the croc-human conflict on Ambergris by establishing a crocodile sanctuary on the island so that problematic crocs do not have to endure the stress of such a long transport. The sanctuary would not only provide a safe contained habitat for the problematic crocs right here on the island, but would provide a place for implementing an educational program at a facility where people could learn about the unique wildlife of the island. In addition, such a sanctuary would yield huge economic benefits to the community. 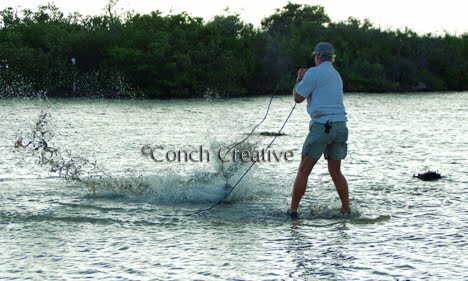 The population assessment is the first step of this grand Crocodilian Conservation effort,” Chenot-Rose concluded. While here Chenot-Rose hopes to visit with the Mayor, the Chamber of Commerce and predominant community members. 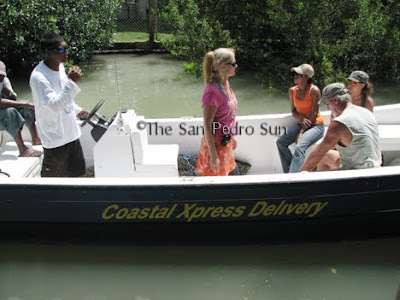 ACES would like to thank the following for their generous support in the relocation of the two problematic crocs from WASA lagoon to ACES: Coastal Xpress, Xanadu Island Resort, Carts Belize, The San Pedro Sun, South Ambergris Caye Neighborhood Watch, Blanca of Xanadu Island Resort, Mr. Joe, Steve Lee, Mary, Alberto Lunez, Edwine Garma, Ali Gongorn and Captain Israel Esquivel. Cayo District’s Macal River reaches new heights!